Clear the Bookshelf is my project to write occasional book reviews so that I actually read the backlog of presumably-excellent books that are gathering dust on my bookshelf (or taunting me with the 0% read stat in my Kindle app). I’ll also review books I’ve known – and usually loved – for a while now. I devoured To Sell Is Human whole on a plane ride a year ago, making notes in the margins and on the back page and turning down pages so I could come back to key passages. And I haven’t stopped talking about it since. Here are the biggest insights I got from it. Insight #1: Most of us spend a ton of time selling. Yes, even you, the person who has never held a “sales” job in your life. You might have dismissed this book by the title alone. For most of you, that’s a mistake. Trying to get your board to agree to an investment? Trying to get employees to change their processes? Trying to get government to pass a policy? Trying to teach students to do something differently? Trying to get your patients to quit smoking? 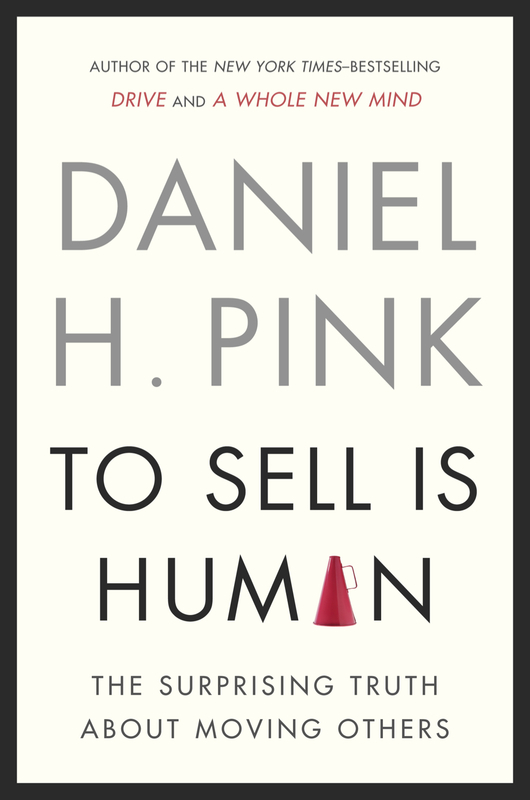 Any time you are convincing others to part with resources – time, attention, commitment – Daniel Pink would argue that you’re in sales, and he’s got some suggestions for you. There’s still this idea that sales has to involve some razzle-dazzle, some element of showmanship or Wizard of Oz trickery that relies on there being a curtain between the seller and the buyer, some kind of trickery. This book argues that’s not the case at all. With the transformations wrought by technology, particularly instant access to information, woe betide the salesperson who tries to snow someone. Sales hasn’t gone away (despite some predictions that it would, with disintermediation), but it has been radically transformed. It’s more of a partnership, and conversation, a discussion. It’s more about uncovering solvable problems. Nobody’s behind a curtain. Everyone is sitting on the same side of the table. Which starts to sound a bit less like old school “sales” and more like the way a lot of non-sales people see their jobs, too. I’ve been told – in recent years, by some relatively young people – that sales people are born, not made. But that’s just not the truth of the matter. Whether you’re selling a product, a service, or an idea, there are behaviours and processes that might help you, and, even better, they don’t require you to embody the obnoxious sales types you might have fixed in your mind. Pink says that self-talk that asks a question (“Can I do this?”) is more effective than self-talk that has the answer (“I can DO THIS!” or, worse, “I will never be able to do this”). Interrogative beats declarative for coaching ourselves. We also don’t have to pretend we can take an endless series of rejection. It’s OK and in fact a good idea to build positive interactions into our day when we’re in a sales mode (whether we’re selling a product, a service, or an idea), to keep up our spirits and motivation. Finding this helpful doesn’t mean you aren’t any good at selling – it means you’re building in systems that will help you do it. You should, in all likelihood. I can’t think of too many people who truly don’t spend enough time in a persuasion or influence function for this book to be useful. It’s a quick read, with practical tips summarized at the end of most chapters. If the introduction is intriguing at all, you’ll enjoy reading the whole thing. Arguably you might get even more benefit from reading this if you’re in an internal role at a large corporation than if you’re in sales, because the ideas will seem fresher (and they’ll be rarer and therefore more of a differentiator for you). But if you’re in sales and are finding the organization around you to be too old-school for your taste, this might be particularly inspiring. 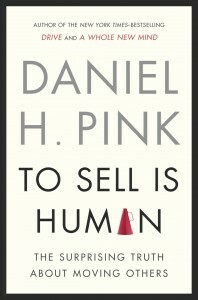 Pink has a number of resources on his website for those who really want to get into it. Want to recommend a book for me to read, or ask a question? Please do. Thanks for the generous review. Much appreciated. And, yep, I do like surprising people with the truth!